Ever since I first heard of "Continuity Associates" back in the 1970s, the hip name invoked in my mind an image of a high-tech glass-and-steel skyscraper with Neal Adams roaming the spacious workspace in a tuxedo or something. The above photograph of Mr. Adams working with the seated Carl Potts paints a more down-to-earth reality for the early days of Continuity. The new issue of Ditkomania arrived in the mail this week. Editor/publisher Rob Imes continues to do a great job every issue. This #91 had a surprise for me: a drawing of mine! Up above I'm instead showing the cover of Speedball that I drew for Ditkomania #25 back in 1988. The paparazzi are always hounding me and asking if I'm bored with getting artwork published in DM (since my association with the fanzine dates back to issue 6 in 1983). The answer I give them is a resounding NO! Still a thrill! I attended the DC Comics Panel at this past spring's C2E2 comic book convention. I can remember similar panels in earlier decades when the speakers were very willing to spill the beans about comic news regarding upcoming releases, but in recent years the trail of crumbs has slowed to a trickle (and how many metaphors can you mix in one sentence?). But you take what you can get and I was pleased to hear the enthusiasm of panelist and new Swamp Thing writer Charles Soule as he spoke on the dais about his premise of The Whiskey Tree in a near-future issue. After each creator on the panel said a few words about their current projects the floor opened up for Questions and Answers. Audience members lined up at a microphone in the center of the room for a turn to ask something of one or all of the individuals up on the stage. Many of the questions were funny or silly but then a certain teenager got his turn at the front of the line and the proceedings turned far more serious. The young man identified himself as a burn victim. He asked why portrayals of burn victims in comics are always so predictably one-dimensional with the person turning to a life of crime to seek revenge. Couldn't a burn victim just as reasonably devote his life to doing good and to trying to prevent what happened to him from happening to others? Whoa. The panel was taken aback by this flash of real life that the young man had blinded them with. For a number of long and slow moments nobody said anything. Then it was Mr. Soule who broke the silence. He thanked the young man for the question and he said that he is always on the lookout for ideas that he can use in future stories and he told the young man that he had made an excellent point. So impressive! That day marked the first time I had ever laid eyes on Mr. Charles Soule and I left that panel room with a high regard for the gentleman. I think this homemade Thor video is lots of fun and very funny! These kids are great! I hope you like it as much as I do. For a frame of reference, below is the Thor movie trailer that they are mimicking. I like the kids' version far better! As I prepare to list a hayfamzone comic for auction on ebay I look it up on the Grand Comic Database to see what relevant details I can dig up. Last week I was readying a 1951 issue of DC Comics' Girls' Love Stories and was startled to see the name "Natalie Krigstein" with a writer's credit. It's not that common of a surname, I said to myself, and I wondered if she might just be related to the great artist Bernard Krigstein. Yes! was the answer I found with the slightest bit more of research. Natalie was the wife of Bernard and she wrote romance comics, first for Joe Simon and Jack Kirby and then for DC and Atlas. The lady's writing career screeched to a halt in the early 1950s but it seems additionally that she posed as the model for one or more characters in Mr. Krigstein's so-classic Master Race story for EC Comics. 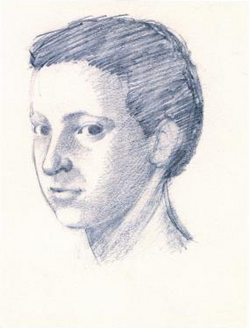 The above portrait of Mrs. Krigstein was drawn by her husband, and you can read a little more about the lady over here. 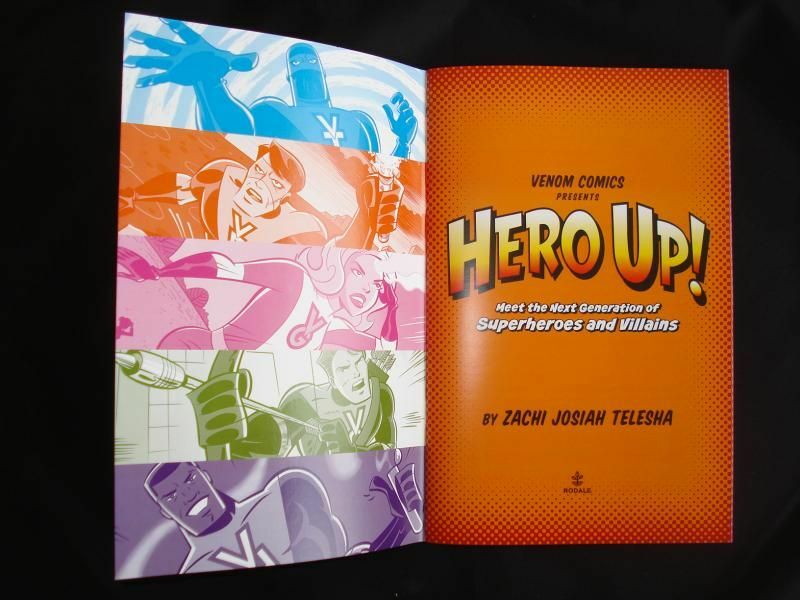 Back here I told you about the young man named Zachi and the comic book he got published. I received my copy of Hero Up! a while back and I've been meaning to follow up on it with you. I do have to say that I was disappointed that Hero Up! is not a comic book in the sense that I had been expecting. It does not feature any artwork with storytelling but rather is on the order of a Who's Who in the Zachi Universe, with full-page drawings of the characters and descriptions of their powers. My disappointment dissipates when I remember that the purchase price goes to charity, and the homage-to-Bruce Timm artwork by Glen Mullaly is a great deal of fun to look at. Back here I told you how to get a copy of your own, and I do encourage you to do that. I figure that anyone reading what I write is certainly also reading what Mark Evanier writes over on his News from me blog (since, after all, his column is a paradigm of blogworld). In case I'm wrong about that though, I feel the need to link to what Mark wrote today about Mort Weisinger, the Superman editor of decades past. Mark's write-up is over here. I found it to be fascinating reading, much of which I hadn't known previously. Among other tidbits, Mark explains how a novel entitled The Contest written by Mr. Weisinger (and/or others) may have played a role in that gentleman's exit from DC Comics. I had never heard of The Contest before but I just ordered a copy on ebay and will write with more after I receive the book in the mail. 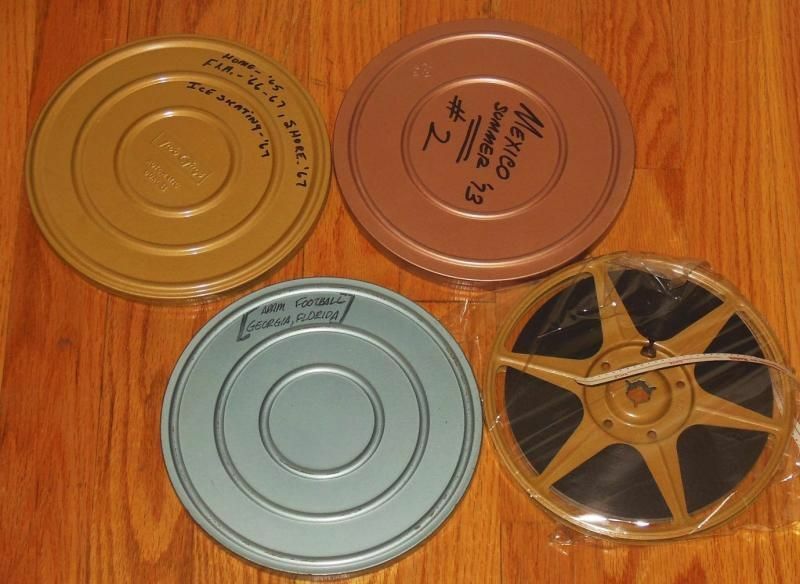 Loyal hayfamzonder Mark Plastrik (you'll remember that I introduced you to the gentleman back here) wrote in to tell me of his recent ebay acquisition: four Super 8 reels of home movies that belonged to Joe Kubert and his family. How about that! Home '65 / Fla 66-67 / Shore 67 / Ice Skating 67. 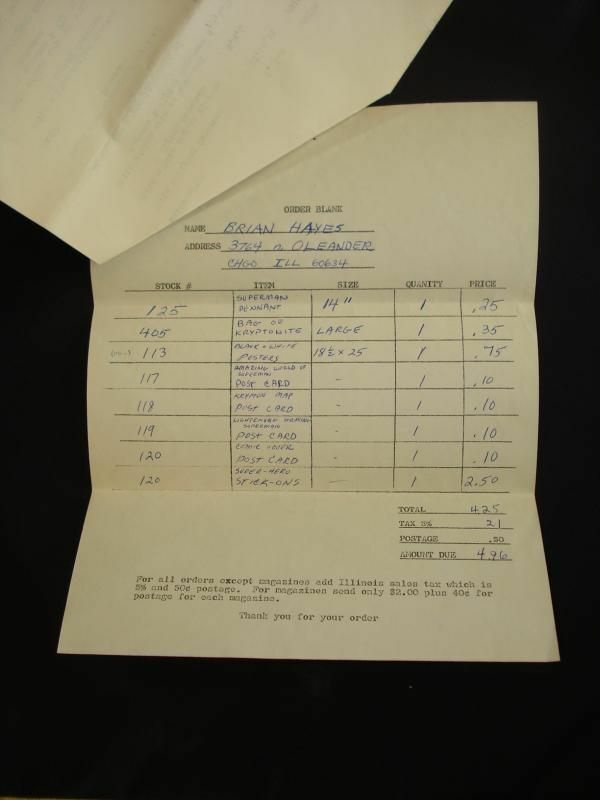 The ebay seller that Mark bought the movies from, comicmanshipper, seems to specialize in rarities relating to Joe Kubert, and you can check out his latest offerings over here. But that lot of 80 35mm slides that belonged to Mr. Kubert that are up for bid as I write this? Forget it! You'll have to out bid me to get those! Atlas Comics is Dead! Long Live Atlas Comics! Recently I told how the comic book shop I visit every week is closing after 25 years. But wait, there's more to the story! I've already explained that Atlas Comics owner John Stangeland will be beefing up his internet presence, but now comes the news that there will also still be some bricks and mortar in his future. This is good news for me because the way John runs his shop is the way I like a comic book shop to be run. 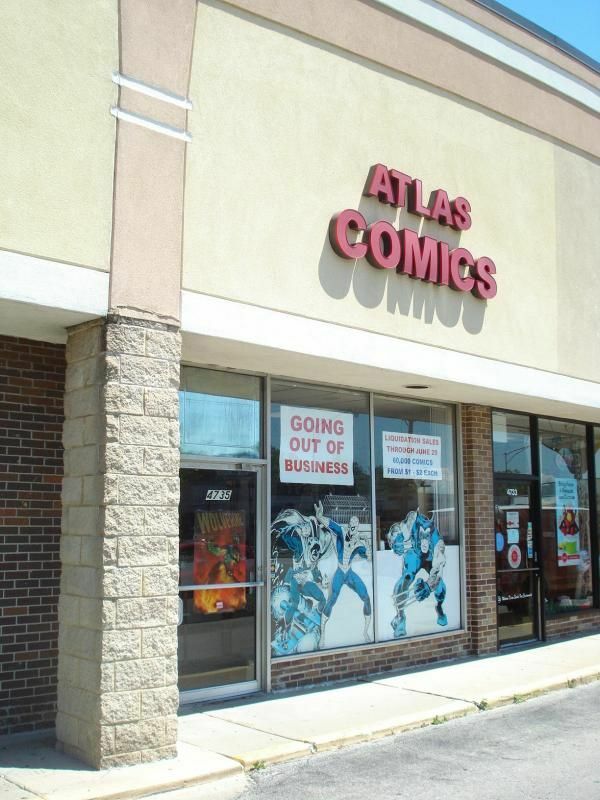 After 30 years in the comic book business – the last 25 of those at Atlas Comics in Norridge, Illinois, I’m calling it quits. I have no regrets, recriminations or disappointments. On the contrary, comic books have been amazingly good to me. They have afforded me an opportunity to work with what I love, and without a boss sitting over my head. They purchased my home, and allowed me the freedom to travel around the world. Those travels proved to me the incredible power of comic books. I’ve seen massive pop culture stores in Barcelona, Spain; small children wearing Spider-Man T-shirts in the remote villages of Thailand; an Iron Man cap on the head of a middle aged farmer in rural Peru, and action figures at a tiny roadside stand in central Turkey. In the main shopping district of Shanghai, China, there is a store devoted solely to knock-off Superman memorabilia. In all these places and many others I met people who loved comics and envied my opportunity to enjoy so much fun and freedom in my job. For their envy, I thank you – the great customers and friends who made Atlas Comics such a long lasting success. Saturday, June 29th, 2013 will be our last day in business. That last day will be the final blow-out of our current liquidation sale, and a going away celebration for the sheer fun of 25 years of comics. I’d like to invite everyone, old and new, to come out and have some food, conversation and laughs from 11:00 am until 7:00 pm, at the venerable old institution at 4735 N. Cumberland Street in Norridge. Let’s try for the unalloyed enjoyment of those riotous, primary colored Captain America adventures of the Golden Age. Or the static electricity of Kirby Krackle hanging in the air. And maybe at the end of the night we’ll raise a toast to the people who actually made it all possible: Stan Lee, Jack Kirby, Will Eisner, Jerry Seigel, Joe Shuster, Bob Kane, Jerry Robinson, Bill Finger, Joe Simon, Max and Bill Gaines, Wally Wood, Steve Ditko, and all the others who created the joy we’ve immersed ourselves in lo, these many years. Atlas Comics will continue to sell vintage comics into the future online. You can reach us at the same phone number (708) 453-2110 and email address (atlas@acomics.com), and you’ll find Atlas on Ebay under the name “atlascomics”. You don’t have to stop buying comics – you just can’t do it at 4735 N. Cumberland anymore. See you on the 29th. Comic Book Creator is a nice little treat that might have slipped by without you noticing it last month. 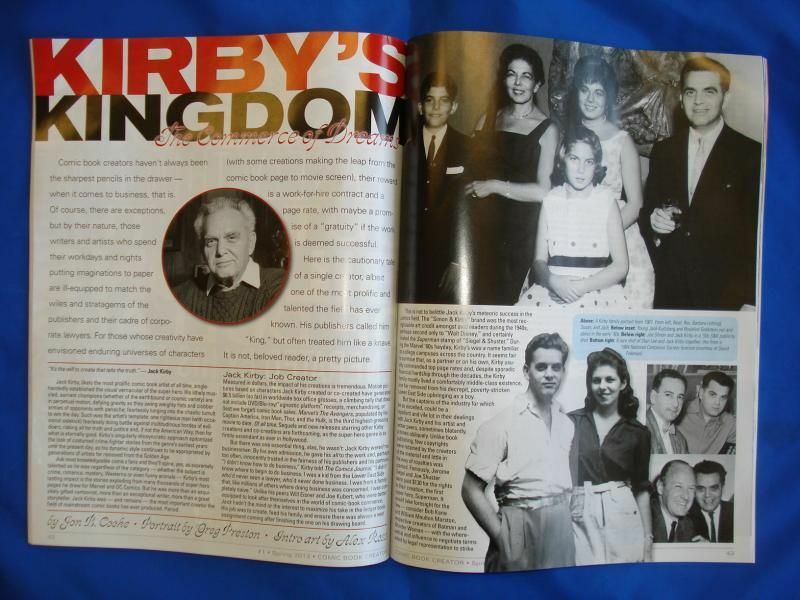 The cover story is a long piece about Jack Kirby and is accompanied by a couple of vintage photos I had not seen before. The new cover for the magazine is an Alex Ross painting featuring Mr. Kirby and a number of his creations, and the gentleman talks about his cover and his other Kirby-related artwork in a separate article. There is even a new Fred Hembeck gag page with Kirby characters dancing around in full color. 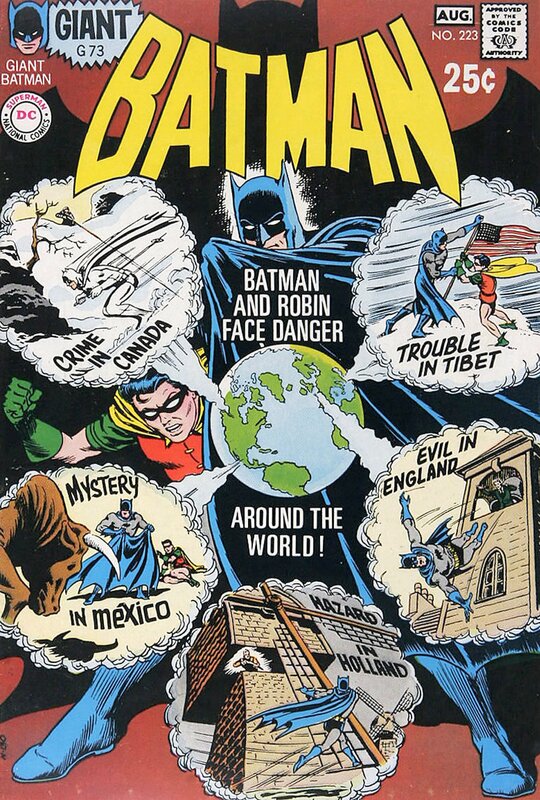 The issue also displays an unused Neal Adams cover to 1969's The Brave and the Bold #85 which is new to me, and I think none of us has ever before seen the paintings of Mr. Frank Robbins. There are enough items in this first issue of Comic Book Creator to make me glad I purchased it, but now I'll let you think about what you would like to do. Best Drawing of Superman Ever? My subscription copy of the latest issue of Entertainment Weekly arrived in the mail yesterday. I was pleasantly surprised to see the above Superman image emblazoned on the cover. You know that great drawing. I know it. For crying out loud, I owned it for 21 years! 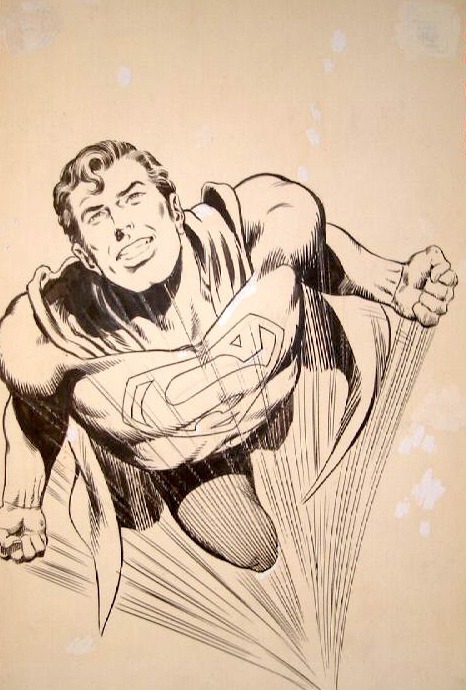 The 1972 cover to Action Comics #412 was penciled by Neal Adams and inked by Murphy Anderson, and was one of only two or three pages of artwork on which those two gentlemen collaborated. Though my favorite Superman artist of all time is the great Curt Swan, this Adams/Anderson effort is possibly my favorite single drawing ever of the character. And I will never get tired of telling you that I owned it from 1985 to 2006! Many of you hayfamzonders have purchased either comics or original artwork from me on ebay, but let me show you a relic from the distant past long before ebay (or the internet) existed. 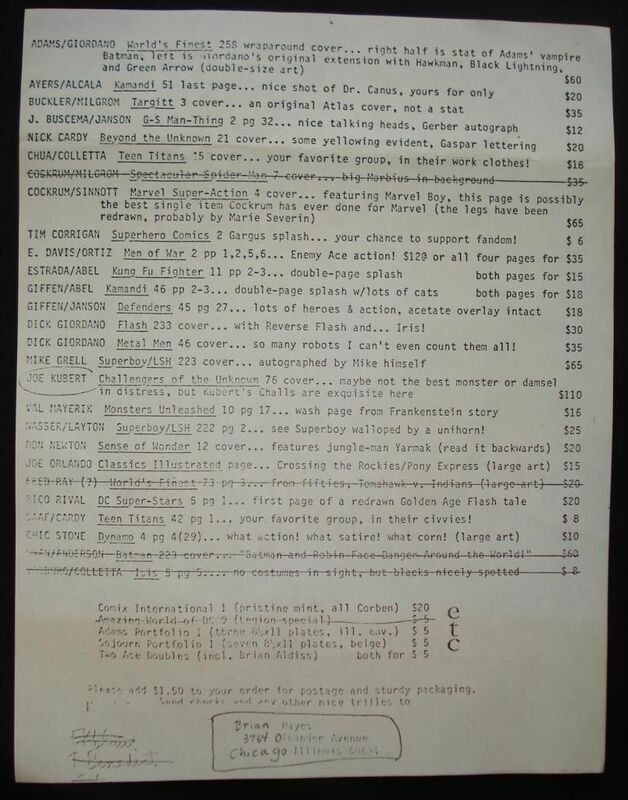 The crossed-out items were sold at that time (and yes, you're reading correctly that the original artwork to a Dave Cockrum Spider-Man cover sold for $35 and that a Curt Swan/Murphy Anderson Batman cover sold for $60), while the unsold pages went for a few pennies more than these listed prices when I ebayed them in 2006. The Moment of Cerebus website posts something every day having to do with Dave Sim and his artwork. Last week when writing about the gentleman's latter-day computer lettering it pointed out that Mr. Sim uses the Joe Kubert font. The article tells how that font was designed at the request of Mr. Kubert himself for that artist's own use, and a link on the Moment of Cerebus site whisks the reader away to a page where they can purchase the John Roshell-designed Joe Kubert font for themselves. 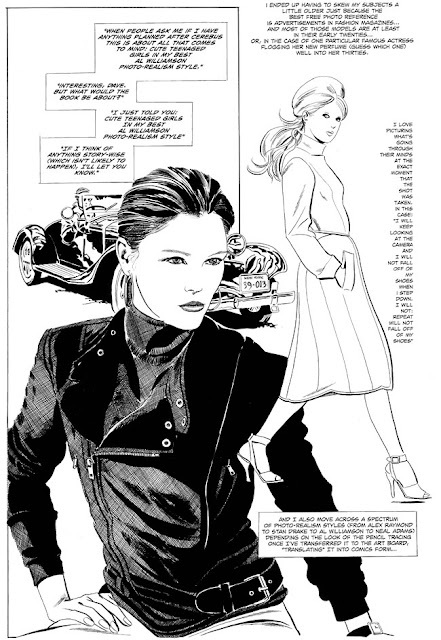 Dave Sim goes on to explain that the Joe Kubert font is very much like the lettering of the great Ben Oda (about whom I have of course glowingly written so many times). And wait until you hear this. If you click on the Ben Oda link in the Cerebus article, you are redirected to one of my articles about the great Mr. Oda! I like that! Let me remind you that you can download Odaballoon, the Ben Oda font, for free, over here. 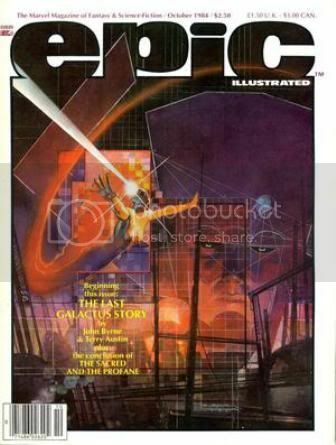 Say, am I the only one who notices that the new film entitled Epic has a logo that is distressingly similar to the logo that Marvel Comics used for its Epic Illustrated magazine back in the 1980s? The similarity struck me the first time I saw the movie logo, but there are four things I like better about the comic book logo: the e, the p, the i, and the c.
I was thinking this morning about movies I saw at the theater in my youth and a horror film named The Green Slime came to mind. Just for fun I looked it up on imdb and was startled to find that the movie's screenplay was written by Bill Finger. Whoa! Did you know that the uncredited co-creator of Batman was writing screenplays in the 1960s?! The imdb page for Mr. Finger also indicates that he wrote the two episodes of the 1960s Batman TV show that featured The Clock King (as portrayed above by Walter Slezak), a character that the gentleman had created as The Clock back in the Golden Age as a villain for Robin in his Star Spangled Comics solo series. If you have 22 minutes to burn you can watch one of those two Batman TV episodes over here. Back here I told you about how I found on the street a brightly colored book of matches back when The Amazing World of Superman opened in downstate Metropolis, Illinois in the early 1970s. Well, I then wrote to Metropolis for more information and they sent me back a list of items for sale in their Gift Shop that could be mail-ordered. They offered a variety of t-shirts ranging in price from $2.40 to 4.00, a souvenir Grand Opening Poster for $2.00, pennants for 25 cents or 75 cents, four different postcard designs for 10 cents each, and a small bag of Kryptonite for 10 cents or a large bag for 35 cents. On the below order form you can see I was interested in all four of the postcards and a large bag of Kryptonite, plus a few other goodies. For some reason I must not have sent my order in. Too bad.